For 2000, Peter Max, one of America's most-renowned pop artists, designed a special color scheme for the No. 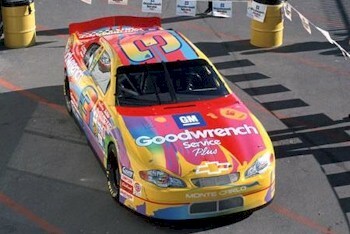 3 GM Goodwrench Chevrolet that seven-time champion Dale Earnhardt drove in both of the May events at the Lowe's Motor Speedway. 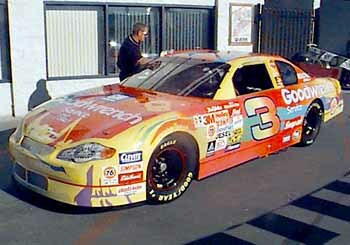 Max's signature vivid colors and bold design replaced the traditional Stealth-black paint on Earnhardt's Richard Childress-owned car for exclusive race appearances at The Winston and the Coca Cola 600. Of course, a special paint scheme for the Intimidator has become a May speed weeks tradition at LMS. Dating to 1995 when Earnhardt and Childress pioneered the paint scheme tradition with the Silver Monte Carlo, but the millennium scheme is a long way from that paint scheme. Max first gained celebrity status in the `60s and `70s with a colorful, psychedelic style that has evolved over his career. "After recently completing projects including painting a $167 million Continental 777 airplane and designing a 500- by 80-foot stage for Woodstock `99, I have landed back on earth and hooked up with NASCAR to paint the famous No. 3 car of Dale Earnhardt," said Max. "I designed the car to look as if it was driven through the waterfall of the Max color spectrum." "For the last six years we have had a different look on the No. 3 car for The Winston, said Earnhardt. "This is by far the most unique paint scheme we've done to date. Peter Max has created some unique artwork over the years. I'm looking forward to driving one of his creations to Victory Lane." 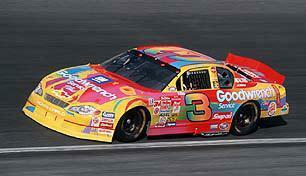 Dale Earnhardt didn't have one of the faster cars in the 2000 Winston. He started the first segment in 12th, but wasn't able to move forward any and finished 13th. Following the first segment, the top 12 cars were inverted. It was a shame Dale finished 13th, because had he finished just one position higher (12th) he would have been in first place after the top-12 were inverted. Eight laps into the second segment, Jeff Gordon got loose and spun in the turn. Steve Park slowed down and Earnhardt ran into the back of Park while Park ran into Gordon. Dale had minor damage to the front of his car from the crash. He made some pit stops and got most of the damage to his nose smoothed out. He went on to finish 10th in that segment. The final 10-lap segment involved a battle between Steve Park and Joe Nemechek that ended in a multi-car accident. When the dust cleared Earnhardt was running in fourth. When the race resumed Dale Jr. passed his dad Dale, Jerry Nadeau and Dale Jarrett to win the race. The elder Earnhardt got by Nadeau to finish 3rd. 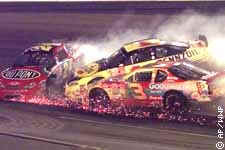 "I thought I could get up there and give Jarrett some trouble, said Earnhardt. "I looked in my mirror and here this thing (No. 8 Budweiser Monte Carlo) comes. He hit the wall back there and it looked like and got it running better. We thought we were pretty good toward the end. We had wrecked our car up a little bit. We kept adjusting on it and working on it. I was really surprised I was up there racing. This red thing ran us down and I knew I just needed to let him go on. I thought I could go up there with him, but I couldn't. We don't seem to have any luck with the paint schemes. We're coming with a black car next year, I'll guarantee you. I wish we could have been up there with him tonight. The Pennzoil car ran good tonight. The Budweiser car won the race and the Goodwrench car ran good. We're happy." Make no doubt about it, Dale Earnhardt Jr. has no problem living in his fathers shadow. Some days, he prefers things that way. Full Story.